Hillary Clinton and the Democratic Party on the Minimum wage. Like Republican Presidential candidate Donald Trump, Hillary Clinton’s position on the federal minimum wage has evolved since first declaring her run for the presidency in April 2015. As of this writing, her stance as stated on her official website differs from that of the Democratic Party platform as approved July 9, 2016. She supported raising the minimum wage to a “living wage” when first announcing her candidacy in April 2015, but did not offer a dollar number for the increased rate. By July of 2015 she first proposed the $12 minimum wage rate, and defended that rate throughout several debates with rival Bernie Saunders, who proposed a $15 minimum wage. In April of 2016, she again said she supported a $12 minimum wage, but said she would support a bill like the one recently passed in New York State, a compromise raising the minimum wage to $15 over time, and at different rates in different regions of the state as appropriate based on economic conditions in the region. 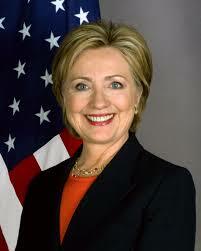 On her official website https://www.hillaryclinton.com/issues/ , on a fact sheet listed under the heading An economy that works for everyone it is stated “Hillary Clinton supports a $12 federal minimum wage — but believes that the federal minimum is just that, and encourages states, cities, and workers through bargaining to go even higher, including a $15 minimum wage in places where it makes sense.” This differs from the official Democratic Platform which states “We believe that Americans should earn at least $15 an hour” …. And “We should raise the federal minimum wage to $15 an hour over time and index it….” This seems to be a compromise between Bernie Saunders call for an immediate raise to $15 dollars per hour and Hillary Clinton’s more moderate raise to 12 per hour. Perhaps Ms. Clinton will clarify her Minimum Wage stance in tonight’s speech at the Democratic National Convention. 3 Comments on "Hillary Clinton and the Democratic Party on the Minimum wage."